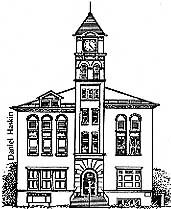 The Town Hall, designed by George J. Metzger, is a three-story structure set over a raised stone basement. The exterior is brick with Medina sandstone used for string courses (see glossary), sills and lintels. The facade is gently asymmetrical. The clock tower is slightly of center and sections of the building to the north and south of the tower recede to different depths from the plane of the tower. Further asymmetry is apparent in the design and placement of the windows and the presence of a dormer along the northern roofline. The building's exterior exhibits the flavor of the Italianate architecture which was popular in America from the mid-19th Century. The lofty, multistoried tower is typical with its setback, string-course, paired arches, and wooden cornices. The classical frames and segmental pediments which enclose the clock face are also Italianate. So too are the brackets beneath the eaves and the capitals used on one of the lower windows. The understated serenity of the the Town Hall's exterior extend to the interior. A stained glass window above the entrance bathe the hallway in soft shades of ochre and green with an occasional touch of red. The liberal use of long-leaf yellow pine for window frames, wainscoting, and balustrade lends the interior a feeling a warmth and intimacy. The Opera House occupies the two upper floors of the Town Hall. The desire for an adaptable space is evident. The auditorium floor is level and the seating is easily removable for dancing. Further, the elegantly curving balcony is hung from attic timbers, rendering intrusive supporting columns unnecessary. The stage floor is raked, or sloped, similar to Shakespearean stages. 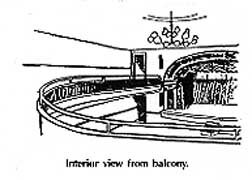 This makes it possible for the audience to see "upstage"as well as "down stage," even though seats are on a level floor. Two proscenium doors introduce Italianate motifs into the interior: spiral columns entwined with foliage, shell adorned pediments, composite capitals, and deep cornices. The broad proscenium arch employs related motifs. The asymmetry of the building's exterior continues into the auditorium, where the main doors do not correspond with the center of the stage. The Opera House experienced changes in use over the years, with corresponding interior alterations. Included were the construction of offices in the corners of the balcony and the main floor and the laying of linoleum over the maple floor. For a time after W.W.II, the Opera House served as a civil defense headquarters. The Town Hall and Opera House are located on Central Avenue just north of Broadway. From N.Y. State Thruway, take exit no. 52 E (Walden Ave. ) Continue east on Walden until reaching Central Ave. (1 mile east of Transit Road). Turn right (south) onto Central. By bus take the Broadway 4A, 4D, or 4F from downtown Buffalo. CAPITAL The head of a column. CLASSICAL. To render in the style of ancient Greek or Roman architecture. COMPOSITE CAPITAL. Having characteristics of more than one style. ITALIANATE. An extremely popular 19th century revival style based on Italian precedents. In a domestic context, often called Tuscan or Italian Villa style. LINTEL. A horizontal element bridging an opening such as a window. PEDIMENT. Simply put, a low pitched gable. PROSCENIUM. That part of a stage in front of the curtain. STRING COURSE. A continuous horizontal band set in the surface of a building's walls. Buffalo's Best is produced by The Preservation Coalition of Erie County.